Bobbit Worms are massive, nocturnal polychaete worms whose front end is dominated by a pair of astonishingly cruel jaws. 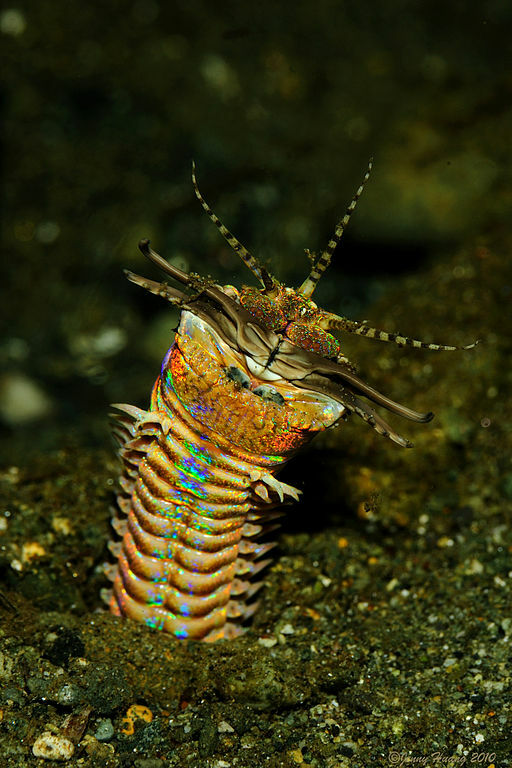 Most creatures have their implements of death hidden beneath cheeks, lips or friendly smiles, but the Bobbit Worm has them right out on show. It's like if deer used their antlers to capture and kill struggling prey. 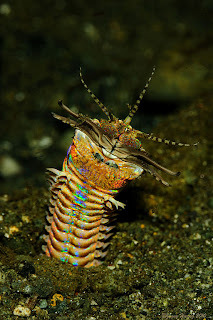 Bobbit Worms come from warm, shallow waters in the Indo-Pacific area. Average adult length seems to be around 1 metre (3.3 feet), but it's said that some individuals have been found to be some 3 metres (9.8 ft) long! They're ambush predators, spending their time in burrows with their head emerging from the sand and awaiting an opportunity to be vicious and deadly. This opportunity is sensed using 3 antennae and 2 palps that point up from the head. They also have a pair of eyes but they don't seem to be so useful. When a hapless fish approaches the burrow, the Bobbit attacks. Lunging with astonishing and rather unwormlike speed, the Bobbit shuts its powerful, serrated jaws with such force that victims are sometimes sliced in half. I bet the Bobbit is all "whoops, LOL!" when that happens. And yet these worms aren't entirely carnivorous. At night they will sometimes investigate their surroundings, crawling around on their side-bristles in search of seaweed and the like to eat. If this miniature tower of malice can eat his greens for a bedtime snack, then there's hope for us all! Based on the name and the term "cruel jaws," I was all ready for this to be one of those nightmarish creatures that dephallusizes its partner after mating. I think I made "dephallusizes" up. You may use it if you like. See if you can work it into conversation today. Delight your friends and colleagues! @TexWisGirl: I don't think they'd laugh at anything less! @Crunchy: There's nothing new under the sun! 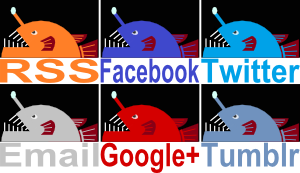 For 'dephallusize' Google turned up a guy in 2006 saying it and stumping one of his readers (as it were), a guy talking about a guitar and some weird page where there was a load of chat. Real Monstrosities was in No. 1 position, though! Thanks, Crunchy! Oh, and there's a myth that that's where it got its name from. Apparently it's not true. I don't think annelids actually have a phallus. I think it's pretty much mandatory!